Aarhus is a city of growth with a population of more than 300,000, Aarhus is Denmark’s second largest city. It is at heart, however, also Denmark’s youngest city when you consider the average age of its habitants which is far lower than anywhere else in the country. At the University of Aarhus alone there are nearly 35,000 students, and there is a total of 25 educational and research institutions in the city, which has also have created a fantastic environment for many entrepreneurial and innovative companies within research and development, graphic design, architecture, engineering, computer science, software design etc. Aarhus could well be Denmark’s oldest city; evidence has been found which shows that there was a Viking settlement here as early as the 8th century. The Vikings settled by the mouth of the river close to the Cathedral and next to our preferred accommodation Hotel Royal near the “Bispetorv” square which was also the centre of the town 1250 years ago, and in The Viking Museum in the basement of the Nordea Bank you are standing right next to the rampart which the Vikings built around Aarhus in the 10th century. Aarhus is often called the smallest big city in the world as we have all the facilities as any big city but still have a cozy milieu as a small village. You will find a lot of shops, cozy restaurants and cafés, museums, art galleries etc. Please see the Link page for further info about Aarhus. 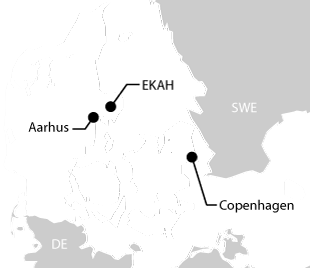 Aarhus airport is our local airport and is placed 40 km from the city center. If you need to discuss route planning to Denmark with us, please make sure to contact us well in advance. Please let us know your ETA and planned route before you leave. An e-mail is OK but you may also call us 24/7 at +45 70 20 00 51. If you are ferrying trans- atlantic please update us again 1 day before planned ETA in Denmark. If you plan to leave EKAH the same day, you must be at EKAH before 1000 local time in order for us to process the paperwork before Customs close. Otherwise we will pick you up and arrange accommodation in Aarhus. Danish Customs are closed for importing/exporting during the weekend. Important: before you start a flight to Denmark, please check with us, that you have received the latest version of the CREW INFO with practical information about the ferry flight to Denmark.